Juxtaposed! Serenity and War. Yes that is a nuclear sub. Sometimes things just don't seem to fit together, like the image here. 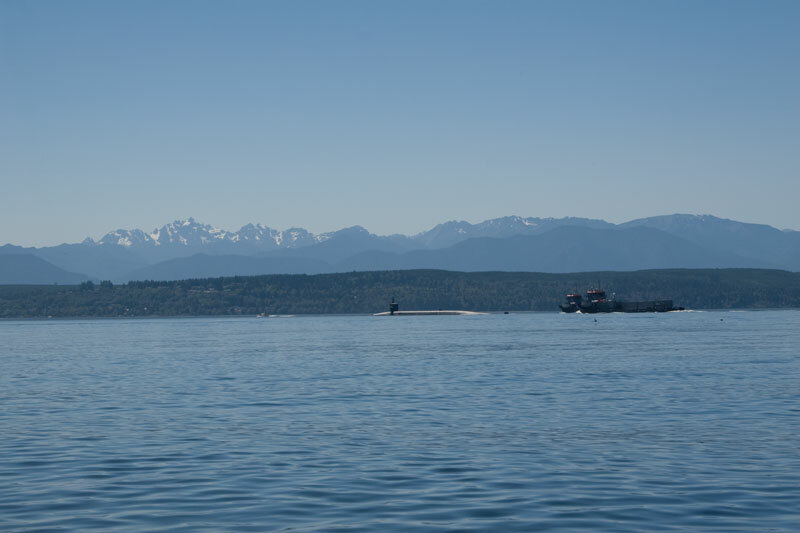 Out on the Hood Canal on a gorgeous (one of the few) day, sun, no wind and then we notice the floating bridge opening, and this monster came through, escorted by four Coast Guard armed vessels, two large what look like merchant ships loaded with containers that travel beside it and two huge push/pull tugs! We stood off but one of the CG boats came quite close with guns pointed towards us. Nasty! Bangor sub base is not far from us. They do a lot of repairs there and their frequent Canal transits cause a lot of trouble when the bridge has to open and traffic backs up for miles! 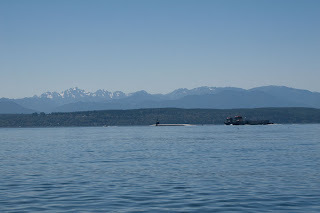 When a sub goes through, it is open for at least 45 minutes and they always seem to manage to do it at peak traffic time - like Fridays in the late afternoon or Sunday evenings when everyone is leaving the peninsula and heading back towards the ferries and Seattle! The nuts are going along, but slowly. We need to move to a warehouse that can be licensed, but the powers that be don't seem to want to do that yet so it is very frustrating. Especially being here on my own with no one to bounce ideas off. I talked to Ryan for 5 minutes and he comes up with ideas! I think that is the hardest part of this business, being the sole person really involved in it. Although now, the marketing people are maybe coming in as equity partners which means they will be more involved. And hopefully with them, communication will be easier than with Annie, who I don't think reads any emails I send her. Or if she does, doesn't respond. But the whole situation is very frustrating. Ryan and I are getting his old concept back on line - valid, the on line magazines for girls between 15-24 to see pictures of boys. It is not called valid any more, but eyesoulheart - so eye candy (the boys) bare their souls to other girls, get/give advice, talk about boyfriends etc (heart) So Ryan is creating the logo and we are both working on the site so that keeps my mind off being pissed off at other people! Weather has been so/so - cloudy mornings some sun in the afternoon, but I think that we have had our summer and that is soooo sad! Anyway, going to look at laptops today before this old workhorse mac dies on me! That would be catastrophic. Too bad the company won't buy one for me. I'd love to stay with a mac, but they are so expensive compared to a pc so will just have to settle this time around.